Food Costs > How Much Does Cayenne Pepper Cost? How Much Does Cayenne Pepper Cost? Cayenne pepper is a type of spice, also known as Guinea spice, used as a flavoring in food and for medicinal purposes. The most popular form of the cayenne pepper is its powdered form. This pepper is generally dried and grounded up into a powder. The term “Cayenne” is often referred to as a ground pepper, but it’s actually a type of chile pepper that can grow up to 12 inches long, belonging to the Capscium Annum family. This pepper is long, thin and has a pungent taste. How much do cayenne peppers cost? Fresh cayenne peppers can be extremely hard to find, but depending on your geographical location, some may be available online via Craigslist or at local farmers markets for about $1 each. Cayenne pepper, as a spice, can cost about $1 to $5 per one to three-ounce jar commonly found at a local grocery store. For example, Walmart sells an eight-ounce container of McCormick ground cayenne pepper for $6. Buying bulk can cost about $2 to $4 per four ounces or $5 to $8 per pound. Spices INC, for example, sells a five-pound bulk bag for about $20. Dried cayenne peppers can cost about $7 to $11 per four ounces if purchased online. It could be cheaper if it were purchased locally. Cayenne pepper pills, designed as a supplement, can cost $3 to $6 per 100 capsules, depending on the brand. Cayenne pepper can be either used as a supplement or as a spice in various food dishes and can be purchased fresh, powdered or dried. Dried peppers are ideal for creating a spicy drink, sauce or adding a kick to meat, eggs, vegetables or nuts. These peppers will be available year round. Most spices will come in one, two or five-ounce containers, and sellers may also sell in bulk, commonly coming in one, five, 10 and 20 pounds containers. This pepper measures 30,000 to 50,000 units on the Scoville scale. Cayenne pepper is high in vitamins, riboflavin, potassium, and manganese. To grow these peppers properly, it’s important to have well-drained soil with very little nitrogen. If the soil has a lot of nitrogen, it can make the plant too lush, preventing the peppers from growing. When you want to plant these peppers, consider growing them six weeks ahead of time in a smaller pot. Grow them indoors and plant them after the last frost of the season. It’s going to take up to 90 days to bear peppers on the plant. 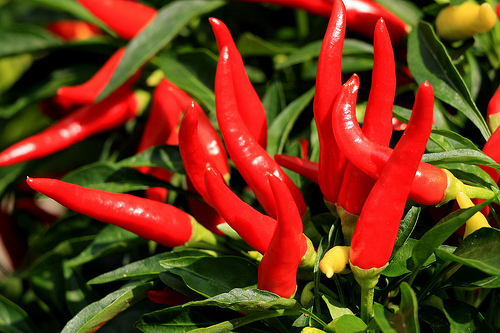 Cayenne pepper is said to be a great remedy for heartburn and peptic ulcers. Every once and awhile, make sure that you keep the leaves of the plants clean. You don’t want to keep soil on the leaves as you’ll find that the leaves can’t get the appropriate sun if the soil is present on the leaves. These peppers will be the hottest when ripe red. In the store, look for a raw pepper that has a bright red color and healthy stem. Also, pay close attention to the body and avoid any that have mold, spots or a spoiled tip. Be patient and harvest these plants when ripe to get the most flavor. Cayenne pepper vs. a red pepper: What’s the difference? A red pepper can be referred to as any variety of pepper that’s red; however, a cayenne pepper will be a specific type. Red pepper is often crushed and sold as a blend of spices. A cayenne pepper is known for its slightly smoky flavor and moderate spiciness, while a red pepper can be milder. It’s always best to buy these peppers fresh as some sellers may mix a poorer herb when drying. These peppers will stay fresh for up to one week as long as refrigerated.